Why Is My Black Hair Thinning? Hair thinning can be caused by a number of issues. Some are within our control, while others aren't. No matter the reason, it can be distressing to realize that you're losing hair. 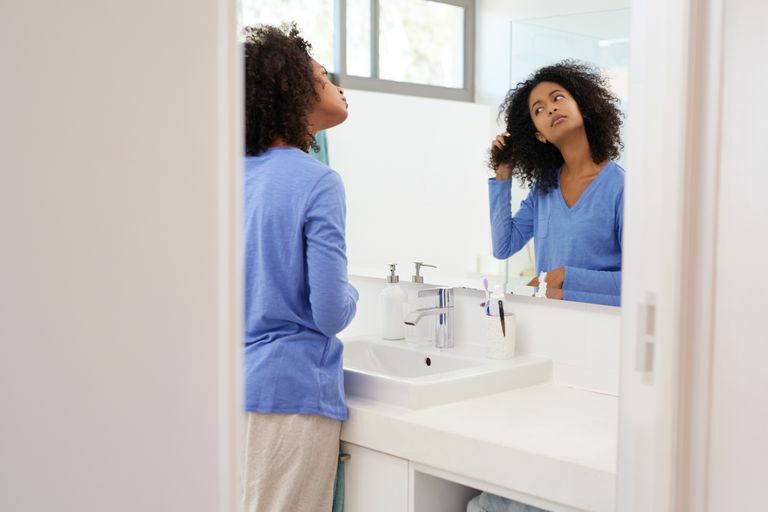 Whether it's just your edges that need help or your mane seems thinner all over, here are some of the most common reasons black women find their hair getting thin. While nothing can be done about aging, this is a common cause of thinning hair. It doesn't only affect men. Extremely thinning hair can be traumatic for women who have always enjoyed thick locks. Choosing different styling methods and hairstyles are both effective ways to camouflage thin hair. Styling should be gentle. This includes using the right tools and accessories, gentle cleansers and fewer chemical treatments. If thinning is around the hairline, you may choose styles that cover this area. If your crown is the problem spot, a short haircut may be in order. You might also want to talk to your stylist about placing wefts of hair over thinning areas. Another cause of thinning hair that you likely have no control over is hair loss caused by medications. In most cases, this is a prescription medicine that you should take for a medical condition. While some medications cause only minimal loss, others (when combined with the condition you're taking it for) can lead to serious cases. It's worth discussing your medication use with your physician to see if an alternative medicine would be helpful. But be sure and consult with your doctor before you go making changes on your own. Some women experience a boon in hair growth during pregnancy, so it can be an unwelcome shock to begin losing that thick, luxurious hair soon after the baby is born. Pregnancy-related hormones often arrest the usual hair shedding that occurs daily, but once the hormones are gone, your shedding routine goes back to normal. Plus, the hair that you would've shed during pregnancy falls out, too! So the regular shedding combined with the delayed shedding can look excessive. The good news is that post-partum hair shedding is almost always temporary. It may last for several weeks or months, but in time, your hair should return to its normal growth habits. Improper use of relaxers, colors and other chemicals is a big contributor to thinning hair. Although relaxers are easy to purchase for home use, following the directions is crucial to avoid hair damage and loss. For example, do not leave it on longer than the recommended time frame, don't apply to damaged scalps and hair, don't apply touch-ups more often than every four weeks, and do not apply relaxers on very young children. If you apply permanent color the same day (or within two weeks) you apply a relaxer, you're asking for trouble. Temporary colors or rinses are safe enough to use at the same time as a relaxer application, but permanent dyes are not. Along with chemical abuse, this is another thinning hair cause that's completely preventable. When heat is the culprit, you usually notice thinning toward the ends of the hair instead of the roots -- this is because some women tend to "bump" their ends frequently with curling or flat irons. Along with thinning, you'll probably notice dryness and brittleness, too, due to too much heat. This is a cause you can easily remedy; if you're the type who's "addicted" to your heat tools, it can take some convincing, but for the ultimate health of your hair, it has to be done. This problem may have begun in your childhood. Tight ponytails and braids pull on delicate hairlines. If pulled tightly enough, the hair follicles will be permanently damaged, leading to hair loss, or traction alopecia. When chemicals are then placed on these already-stressed hairlines, thin hair is often the result. Once a hair follicle is dead, there's no amount of treatment that will bring it back to life. Whether you're styling your hair or your child's hair, ponytails and braids should not hurt. If you feel any pain, loosen the style. This doesn't mean that you can't ever wear ponytails or braids again. It simply means that you should avoid any tight styles over extended periods of time. Ponytail holders or elastics should be removed before going to bed. Also, don't wear the same styles repeatedly -- this places tension on the same areas over and over again. Switch up styles every time you fashion a new set of braids if they're going to be worn for weeks at a time. You can't control all of these issues, but you can change some. Work on the ones you can control while looking for other solutions that you can't.